MUA Bullet | a bargain £1 slate grey polish that applies evenly in 3 coats. Orly Moonlit Madness | dark cranberry polish with a shimmer finish that applies evenly in 2 coats. Barry M Blackberry | deep royal blue that is opaque in 2 coats. Barry M Berry Cosmo | dark berry-purple that provides full coverage in 2 coats. Rimmel Block Your Green | rich turquoise-green polish that is opaque in 2 coats. Models Own Purple Grey | as the name suggests, a purple-toned grey polish that applies evenly in 2 coats. Revlon Impulsive | deep purple polish that is opaque in 2 coats. Essie Mind Your Mittens | blackened navy/ teal polish, you could probably get away with 1 coat but I like to apply 2. Seeing as it is now officially Autumn, I thought I’d share with you the 8 stand-out Autumn nail polishes from my collection. I associate Autumn with deep red, blue and purple hues with some softer grey and green tones. I seem to own a lot of dark reddy-purple shades, so they must be the colours I am subconsciously drawn to. I am missing a warm brown, mustard yellow and golden orange in my collection and I have my eye on some of the Barry M Autumn/ Winter shades, but I really shouldn’t (read: I won’t be able to resit) add(ing) any more polishes to my collection. 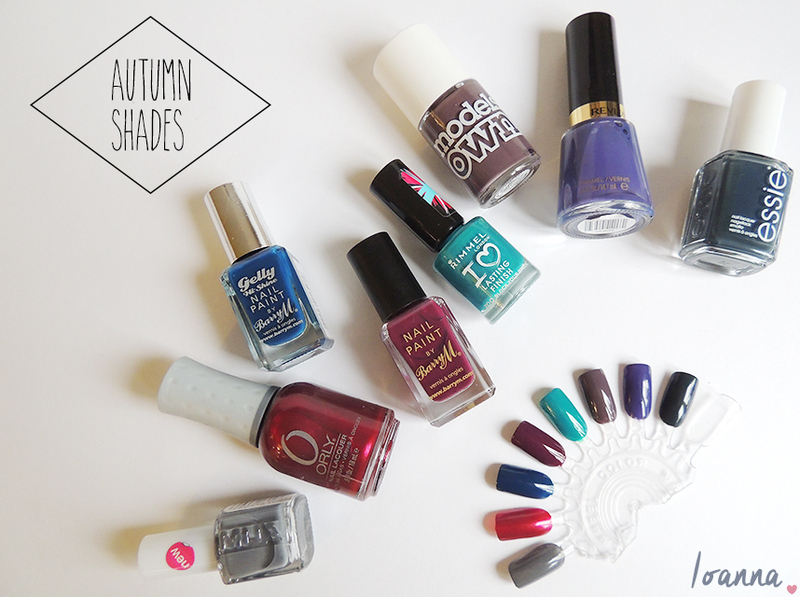 What are your Autumn polish picks?